NATURAL HABITAT AND PREFERRED SITE: Madrone grows in the Chisos, Davis, Del Norte, Vieja, and Guadalupe Mountains of the Trans Pecos and parts of the Edward’s Plateau. Grows well in rocky, limestone or igneous soils in canyons and occasionally open areas in the mountainous regions of Texas. It can grow in slightly acid to alkaline soils but needs excellent drainage in either case. It can grow in full sun or light shade. 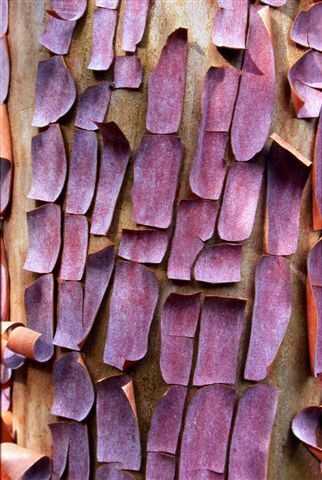 IDENTIFICATION INFORMATION: Madrone is usually a multi-trunked tree with beautiful bark that is reddish brown, thin and peels in sheets to reveal various colors of underbark. It usually has crooked stout trunks and dark green evergreen leaves. FLOWERS AND FRUIT: Flowers are creamy white to pale pink, urn or lantern shaped, blooming February through April. Fruit is round, ¼ to 1/3 inch in diameter, dark red or sometimes orange or golden, fleshy, edible berries that contains up to 10 seed. Fruit has been referred to as raspberry like clusters. It forms from October to December. BARK: The bark is exfoliating and beautiful. When the older layers slough off, the newer bark is smooth and shows a range of colors from white to orange to shades of apricot and tan and even dark brick reds. In the Hill Country the plant is called Naked Indian or Lady’s Leg because of its smooth red bark. FOLIAGE: New leaves are reddish maturing to glossy green with red tinges on the undersides of the edges. CULTURE: Madrone is easier to grow than is reported, if it isn’t over watered. The organic program helps to eliminate typical damping off and other root fungal diseases that can plague madrone. It grows best in full sun but can take some light shade. The critical cultural factor on Madrone is-don’t over water and make sure the plant has excellent drainage. Horticultural cornmeal and the Basic Organic Program are quite very important to this plant. PROBLEMS: Root fungal diseases from the soil that doesn’t drain properly and other problems related to poor drainage. Madrone is also hard to transplant from the wild. PROPAGATION: Collection of fruit can start in September but usually the berries aren’t fully ripe until October or November. You have to move fast because of the birds often get the best berries, which are the heaviest and most fertile. Seeds do not store well and should be planted immediately. If they can’t be, place in cold moist storage at 35 to 40 degrees. If the seed are gathered from November to December they usually need no pretreatment. Seed collected earlier may require about 30 days of cold treatment for uniform germination. Seedlings are extremely sensitive to excessive moisture, environmental stress and damping off. Damping off can be prevented with horticultural cornmeal. Elimination of high nitrogen synthetic soluble fertilizers will help greatly. Garrett Juice in a diluted form is the best fertilizer for the young seedlings. Young seedlings do benefit from partial shade the first growing season. Madrone in the wild germinate and start to grow under native junipers. Add shredded cedar or cedar flakes to the potting soil or planting medium and success rates dramatically increase. INSIGHT: Madrone has the reputation of being cold sensitive but that is simply not true. Madrone survived without any problem the winters of 1983 and 1984 in Texas at the A&M Research Center and other sites as well.